Retirement fund body Employees Provident Fund Organisation (EPFO) on Monday announced a rise in interest rate on provident fund (PF) deposits to 8.75 per cent for 2013-14, to benefit 50 million subscribers. The interest rate on PF deposits in the previous financial year was 8.5 per cent. The decision to raise the rate was taken by the Central Board of Trustees (CBT), the apex decision making body of the EPFO. "We have decided to recommend to the government an 8.75 per cent rate for 2013-14 to its subscribers," Labour Minister Oscar Fernandes, who chaired the CBT meet, said. The EPFO's recommendations would now be vetted by the finance ministry. Once the ministry gives its concurrence to the decision, the interest would be credited into the accounts of subscribers. EPFO Central Provident Fund Commissioner K K Jalan said: "We have estimated an income of Rs 25,048.5 crore for 2013-14. EPFO would require Rs 25,005.4 crore for providing an 8.75 pre cent rate of interest for this financial year and leave a surplus of Rs 43 crore." 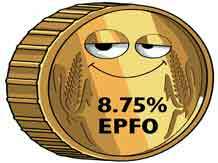 EPFO also announced a 20 per cent cover increase in Employees' Deposit Linked Insurance Scheme as an interim measure. Under this scheme, the family of a worker can get a maximum sum assured of Rs 1,30,000 in case of his/her demise during the service period. After the raise, the maximum amount would be Rs 1,56,000. The CBT has also approved increasing minimum administrative charges for managing EPF Scheme and EDLI Scheme to Rs 500 and Rs 200 a month from Rs 5 and Rs 2, respectively. The charges for non-functional firms having no contributory members have also been increased to Rs 75 and Rs 25 per month, respectively, for the two schemes. EPFO has a corpus of Rs 5 lakh crore. When asked about its plans to improve investments, particularly Special Depositor Scheme (SDS) which earns an eight per cent rate of return, Jalan said: "We will definitely take out money from SDS and invest in high-yielding instruments. We will soon work on a proposal." On the labour minister's idea of deducing extra 10 per cent on basic wages by EPFO for providing housing to workers, the he said: "We will work on the proposal. He has a lot of experience." The CBT also initiated the process for selection of multiple fund managers and formed a panel to appoint a consultant for the purpose. CRISIL is providing consultancy services to the EPFO. The trustees also asked the Finance, Investment and Audit Committee to look into the proposal that sought more freedom for the EPFO to trade and exit investments besides allowing it to refrain from investing in bonds of states. The board also reviewed the performance of its four fund managers since August, 2011. The State Bank of India remained on the top by earning a return of 9.23 per cent on investments, followed by Reliance Capital Asset Management at 9.19 per cent. HSBC AML and ICICI Sec PD earned 9.18 per cent each, above the benchmark rate of 9.11 per cent. The EPFO also launched an electronic return facility for exempted establishments (private PF trusts). It will benefit 3,000 exempted establishments which are now required to file their monthly and annual paper returns. These establishments which are otherwise managing the provident fund trust on their own will now get the facility of electronically reporting about their work. This electronic return will replace the earlier monthly and annual paper returns filed by exempted establishments.